In a new Copyright decision, the Supreme Court has modified the doctrine of separability that allows for copyright of works of authorship associated with useful articles. The design of a useful article … shall be considered a [copyrightable] pictorial, graphic, or sculptural work only if, and only to the extent that, such design incorporates pictorial, graphic, or sculptural features that can be identified separately from, and are capable of existing independently of, the utilitarian aspects of the article. if the feature (1) can be perceived as a two- or three-dimensional work of art separate from the useful article and (2) would qualify as a protectable pictorial, graphic, or sculptural work either on its own or in some other medium if imagined separately from the useful article. In walking through this, the court held that two-dimensional surface decorations will not always be separable, but the ‘artwork’ applied to the cheerleader uniforms at issue here did pass the test. The Star Athletica decision will further blur the line between the intellectual property spheres and savvy IP strategists will continue to layer overlapping IP rights. A challenging aspect of the decision will be the “work of art” requirement. Ron Mann has a write-up on this poorly written opinion that we can only hope will be fixed by Congress soon. What the court does not state expressly in that part of its opinion is that the standard for determining whether a graphic work (for example) is copyrightable is minimal. Unlike patents, which require a notable step of inventiveness, the level of expressive spark necessary for copyright protection is quite low. So once the court has said that any design can gain copyright protection if it would be protectable if placed first on a piece of paper, it really has ensured that all but the subtlest graphic designs will be able to gain copyright protection. To put it more bluntly, once we determine that the designs “hav[e] … graphic … qualities … [and could be] applied … on a painter’s canvas,” the test for copyrightability is met. What is a “mess” is your continued lack of ability to grasp the IP law that is copyright law, Malcolm. should not be talking about copyright because he apparently has zero clue about copyright law. Does this mean that fashion is going to be copyrightable? Does this mean that fashion is going to be copyrightable? It sure seems like it. Even if respondents ultimately succeed in establishing a valid copyright in the surface decorations at issue here, respondents have no right to prohibit any person from manufacturing a cheerleading uniform of identical shape, cut, and dimensions to the ones on which the decorations in this case appear” (p. 12). It is rather unusual that fashion hasn’t previously availed itself of the copyright regime. Did they provide an example of two dimensional surface decoration that isn’t “separable” according to their definition of “separable”? Is it just me or is this two-part “test” for copyrightability both redundant with respect to the two parts, and also a bit circular? I think the best way to think of this case is that the court basically got the correct result – I thought the 2D application of cheerleading uniforms is separate from the underlying garment. I would have wished for an example of a 2D article that would FAIL their test. I can only think of one example so far: a 2D camouflage print. In any event, as explained above, our test does not render the shape, cut, and physical dimensions of the cheerleading uniforms eligible for copyright protection. But that runs headlong into the statutory language of “sculpture”, which I think we all agree is the more thorny area of separability analysis. Hopefully, lower courts will provide guidance in that area as well. A good example is that wavey bike rack case. 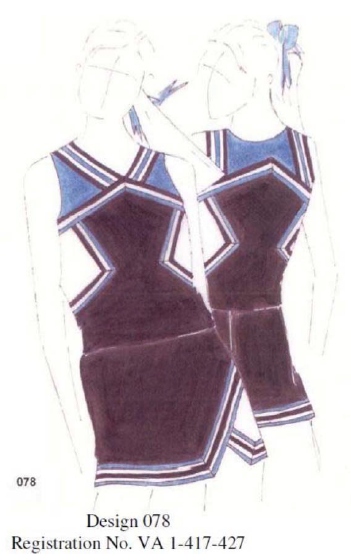 How exactly is a cheerleader uniform-shaped and colored “2-D” design deemed “separable” from an actual cheerleader uniform (other than philosophically)? How is anything deemed to be 2D separable? Not sure the question you are asking even makes sense, given the context here. Should they apply an objective analysis instead? If so, what’s the analysis? I celebrate your March 22, 2017 article entitled “Supreme Court Cheers on Copyright Separability” which does indeed interest me, the artist responsible for U.S. Copyright Registration Number “Gp 67824” which covers my sculpted “work of art,” my two and three dimensional mobile sculpture of the American Flag. To further celebrate the your article and the recent Supreme Court decision may I refer you and your readers to the separate utilitarian aspects of my overlapping but long expired utility U.S. Patent 3,645,026 and design U.S. Patent 223,933 whose published images and separable well known American Flag graphics further clarify both your article and the Supreme Court decision. In case you and your readers are interested, the original of my copyrighted American Flag mobile sculpture is also trademarked “New Glory” and “Mobility ’76″which I loaned to the Allentown Art Museum’s catalogued exhibition entitled “The American Flag In The Art Of Our Country”. As I see it, this clarifies the “work of art” point not just the patented and trademarked points which may further interest “savvy IP strategists” who, in addition to artists, “layer overlapping IP rights” for commercial reasons and/or an overlapping reason to celebrate! Respectfully, if you had ever tried to assert that utility patent (?!) against me or my clients, it would have gone up in red, white and blue flames. Kudos to Breyer and Kennedy for a much needed dissent here. Hopefully Congress will step in to fix but I don’t expect that to happen soon.